Time after time A24 brings out phenomenal films that shock you, move you, and entertain you in ways you have not previously experienced. 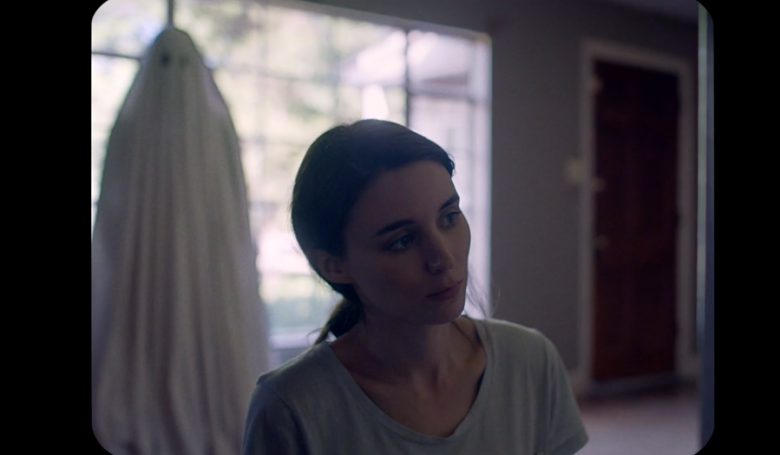 ‘A Ghost Story’ is no different, this Romantic Drama is an immensely deep and moving journey focusing on strong themes that will stick with you long after the credits roll. The less you know about the plot the better so i’ll put it briefly; The film follows the recently deceased C (Casey Affleck) who returns to his home to try and connect with and console his bereft wife M (Rooney Mara). David Lowery (if you didn’t pronounce his last name in Martin Lawrence’s voice from Bad Boys, you’re lying) writes and directs this movie exquisitely, the pacing is flawless, what little dialogue there is is captivating and the cinematography is littered with strokes of genius. Affleck and Mara are great in their respective roles and bring so much power, emotion, and meaning into every scene they’re in. I will start with the undeniably beautiful cinematography, flawless shot selection, and exquisite use of various framing techniques. Cinematographer Andrew Droz Palermo does an incredible job in framing every scene to where i was mesmerised by the shot placement alone. One of the more obvious unique qualities this film has adopted is the use of a boxed 1.33:1 aspect ratio, giving the film a very vintage feel to it, as if we are peering into these people’s life through a lens. It works poetically with the story being followed, it adds a sense of claustrophobia and creates a more intimate setting within this house. One thing I love beyond the consistent boxed frame is the framing of many shots by using simple doorways and widows. It’s such a simple and efficient way to frame a shot and direct your attention at a specific part of the screen and I loved every minute of it. Many scenes tend to linger on a specific detail for a lengthy period of time and tell a strong and moving part of the story in a single scene. Plot elements are delivered in a way that doesn’t explicitly tell you, rather it has you piece things together whilst you sit and watch these long and gradually building drawn out scenes play out. There is one sequence for instance where you spend a good 7 almost unbroken minutes watching a character eat, and with no dialogue every bit of story development is told through the actor’s performance which is incredible. The combination of some haunting visuals and a magnificent chilling yet sombre score create an environment that makes you feel as though you yourself are trapped within this house. Much like this entire film it is beautiful and emotional, yet also creepy and unsettling in such a poetic and satisfying way. The delivery of the themes in this movie is ambitious but it pays off in every way imaginable. You have strong themes and messages on death, love, grief, life, and everything is delivered in such a powerful manner it hits you hard in a way that’s sad but oddly rejuvenating. I mentioned it before but this really is a moving experience, it goes so far as to touch on themes surrounding the afterlife and moving on that will no doubt remain in your mind for a while. There is one dialogue piece around half way through the movie that is phenomenally written and very meaningful in the context of this film especially but also in the real world. It touches strongly on love, faith, death, pain, life, legacy, perseverance, meaning of life, and it is a beautiful enlightening sequence right in the middle of these otherwise chaotic events. The scene does contrast the rest of the film in a way that can seem jarring, I mean, you have more dialogue here than in the entire rest of the movie and the contents being told to us are implied visually through other scenes just as effectively. But i loved it nonetheless. So in the end, despite the title suggesting a place within the horror genre it most definitely is not, rather it is a Romantic Drama that will grip you right from the outset and guide you to a moving and satisfying finale. I cannot get enough of the story this movie tells and it does so through an unsettling score, haunting visuals, and stunning cinematography that had my eyes glued to the screen. It may not be a film for everyone but the beautiful story it tells is well worth it. Previous What Exactly Are The Allegorical Meanings Behind mother! ?